'Clouds behaving like creatures! I wanted the clouds to look alive with some sort of animal life', James Gleeson 27 August 2002. 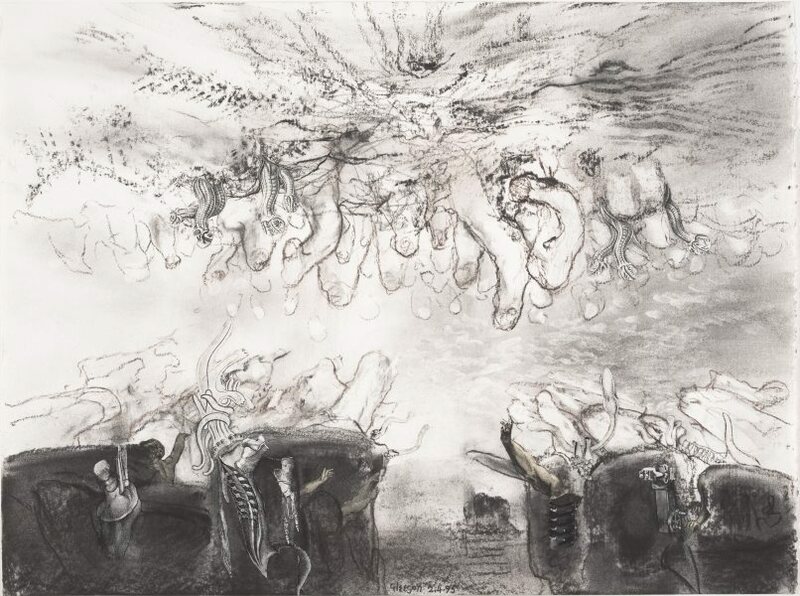 A study for tentacles similar to those in the sky of this drawing is in the AGNSW's Gleeson 'Sketchbook 2'. They can also be compared to the tentacles in the monumental painting 'Preparations at Patmos' 1983 and its study (see Lou Klepac, 'James Gleeson, landscape out of nature', Beagle Prees, Sydney, 1987, plate 2, 3). Hendrik Kolenberg and Anne Ryan, 'James Gleeson: drawings for paintings', Art Gallery of New South Wales, 2003, pg. 111. Signed and dated lower c., charcoal "Gleeson 2.4.95".